The below artworks are the most important by Jean-François Millet - that both overview the major creative periods, and highlight the greatest achievements by the artist. 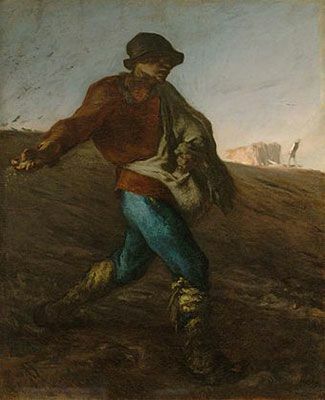 Artwork description & Analysis: A man with a bag of seeds across his chest strides, long-legged across the extreme foreground of the canvas as he flings his right arm out to scatter handfuls of seed. As he works a flock (properly known as a 'murder') of crows circles behind him on the left, and highlighted in the distance on the right, a man behind a plow drives his team of oxen, preparing the soil for planting. By the time Millet created this work, he had already fled Paris that was going through political upheavals and settled in nearby town of Barbizon. What sets Millet's work apart from his Barbizon school compatriots is that, while they emphasized landscape, particularly of the forests, he emphasized the human figure, often a rural laborer isolated in the fields. As he said "My dream is to characterize the type," and here, he creates the common man as laborer. The art historian Alexandra Murphy wrote, "among countless prototypes, the illustrations for October in the Très Riches Heures of the Duke de Berry, depicting a similar sower - capped, wearing leggings, and holding his seed bag in his left hand - is often suggested as a source for Millet. But as with so many of his images, The Sower is more likely to have evolved from the conflation of several well-studied visual memories." At the Salon of 1850-1851, the painting was both praised and attacked. While the art critic Clement de Ris saw it as "an energetic study full of movement," the critic Théophile Gautier described it as "trowel scrapings." The American poet, Walt Whitman, praised its "sublime murkiness and original pent fury," and saw in it the prototype of Creative Man, sowing the seeds of a new age. As muscular and heroic as Michelangelo's figures, and looming over the landscape like Goya's giants, the figure occupies much of the foreground, dominating the canvas. 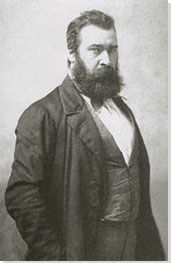 Art historian, Anthea Callen, noted, "Millet intentionally transformed his human laborer into a sinewy giant of a man by elongating his proportions...Reinforced by the sower's dominance of the pictorial space and our low viewpoint, his menacing appearance to the Parisian bourgeoisie in 1850 is thus readily explicable." Despite Millet's liberal use of shadow his use of primary colors allows the figure to stand in stark relief against a field of earth tones. This is a practice used often and to great effect by great renaissance masters including Leonardo da Vinci and Raphael Sanzio. The painting's sense of vigorous movement is underscored by the wealth of dynamic angles that radiate outward from its central figure. The small figure rendered vaguely on the sunlit horizon, tilts back, its angular line further emphasizing the downward movement. The placement of the day's waning light behind the sower emphasizes the shadowiness of foreground. His eyes obscured by his hat, his clothes dirty from his labors, and the crows wheeling after him, eating up the seeds, undoing his efforts all create the sense that he is 'everyman' trying to outrun the gathering darkness. Artwork description & Analysis: A group of harvesters, dirty and tired from their labors, their tools scattered around them, rest in front of large, golden-hued stacks of grain. On the left, a man presents a woman to the group. Millet originally intended to depict the Biblical story of Ruth, a widow who met Boaz, the landowner and kinsman who eventually became her husband, while she was gleaning in the fields. 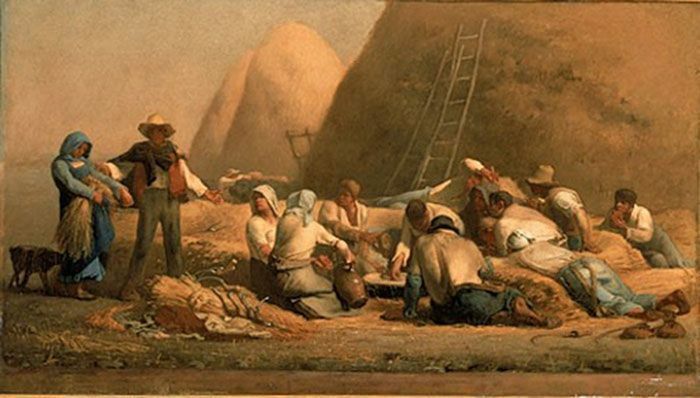 Showing the work at the 1853 Salon, Millet changed the title to Harvesters Resting. One of his few works that show a group, rather than an isolated figure, in a landscape, Millet's tableau-format composition and soft palette indicate a knowledge of the Classical French Baroque artist Nicolas Poussin. 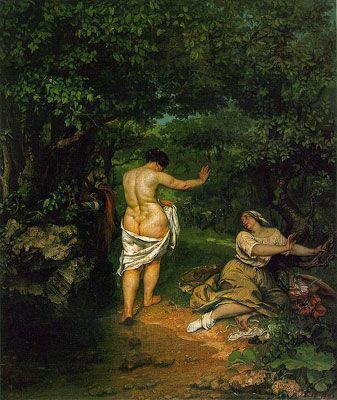 Though it won a Second Class medal at the Salon, the only time his work won an award, art critics like Paul de Saint-Victor said, "these paupers don't touch me...It disgusts me to see Ruth and Naomi surveying Boaz's field as if on stage in a theatre." The pictorial emphasis upon the harvesters and the grain stacks behind them allows Ruth and Boaz to appear as figures peripheral to the central focus. What has been emphasized is not the romantic Old Testament story of faith bringing two people together, but rather a contemporary group of hot and dusty field workers resting from their labors. Ruth's face is downcast shyly, and Boaz, acting as intermediary, visually joining her figure with the group field workers. Thus, Millet brings into focus the common laborer's centrality in history and scripture. Artwork description & Analysis: Three peasant women gather grains from what's left at the end of a harvest day as the evening shadows gather around them. In the background, a horse-drawn cart full of wheat, haystacks, sheaves of wheat, a man on horseback, a village, and a large crowd of laborers depict the abundance of the harvest. 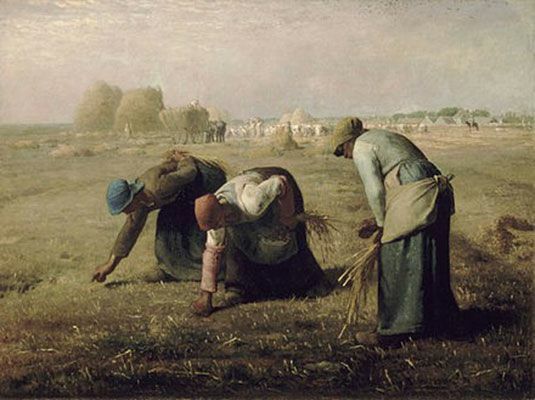 In Millet's day French farmers followed the Biblical injunction to leave gleanings (or left-over scraps of the grain harvest) in the fields so that poor women and children could live on them. Millet's Gleaners occupy the extreme foreground of the canvas. The grinding poverty of the peasant women, evident in their rough, simple garments, and the back-breaking work of collecting individual grains appear as a contemporaneous depiction of the Biblical directive. Shown at the 1857 Salon, the painting was criticized for its depiction of rural poverty. One reviewer said, "These are homely scarecrows set up in a field: M. Millet's ugliness and vulgarity have no relief." The painting is dominated by the sculptural figures of the three women. Arms extending toward the ground, the emphasized lines of their shoulders and backs convey the strain of the arduous work. Each woman is depicted engaged in a specific task; one searches for stray grain on the ground, one collects the grains and the third ties them all together. Their faces are hidden, suggesting a sort of homogeneous anonymity rather than individuality. As with The Sower, that anonymity allows them to represent all of the poverty-stricken peasants of France, rather than simply these women. The contrast between the shadows lengthening around the women and the illuminated background where the harvesters are celebrating conveys the distinction between poverty and plenty. The distant steward on horseback, supervising the harvest, represents social order and the privilege of distance from hard labor. The leavings of grain, scattered on the ground, glisten like jewels against the drab color of the ground, yet the viewer cannot help but realize how meager they really are, and how much effort the women must make to simply live. Even so, despite their straightened circumstances, Millet bestows a certain dignity upon them. They display a measure of quiet fortitude amidst the monotony of their efforts, and despite the simplicity of their garb, their figures are robust, accustomed to the rigors of their working life. Artwork description & Analysis: Arguably Millet's best-known work, The Angelus depicts a man and a woman standing in the foreground, with heads bowed, the man holds his hat in his hands, and the woman folds her hands in prayer. The man's pitchfork rests in the earth beside him, and, behind the woman, a small cart contains sacks of harvested potatoes. A basket of potatoes rests on the ground between the couple and potatoes dapple the earth at their feet. The sun is setting, but in the distance where a church steeple and part of a village are visible the sky still shows daylight. In Roman Catholic villages of the time, the church bells would ring out three times daily, at 6 a.m., at noontime, and at 6 p.m. for the prayer (called the Angelus), and it is at such a moment that the couple stops their work to pray. Despite their humble circumstances, this simple act of devotion and the sculptural quality of their figures lends them a kind of quiet dignity, yet their worn clothes, and their bowed shoulders suggest a life of earthly toil. The gathering dusk engulfs them suggesting the difficulty and perhaps despair of their struggle, the Angelus, their prayer for deliverance, and the sky beyond still lit by the sun stands in stark contrast, punctuated by the steeple connecting Heaven and Earth, the ultimate goal of their struggle and their faith. Revisiting a subject that he depicted in The Potato Harvest of 1855, Millet painted this work as a commission for a Boston art collector. 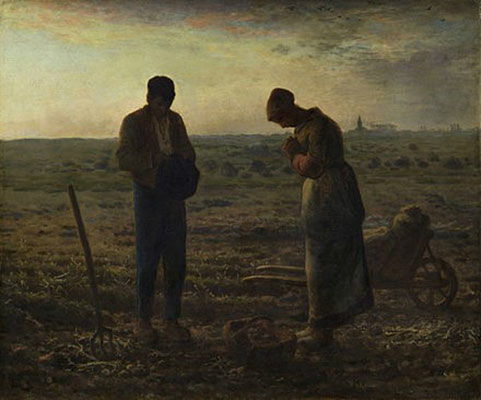 Originally called Prayer for the Potato Crop, Millet changed the title and added a church steeple to the work, when the collector failed to purchase it in 1859. 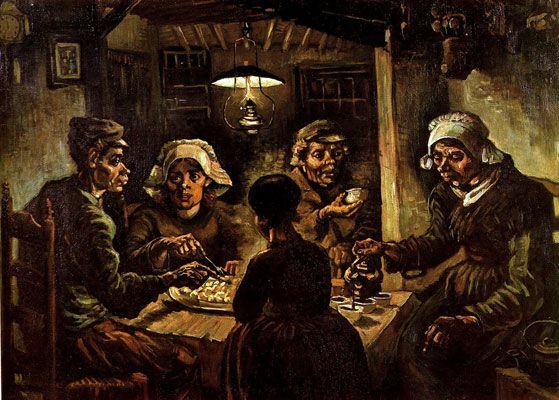 The work influenced Vincent van Gogh's The Potato Eaters of 1885, and served as a catalyst for his return to painting, so great was his admiration. For the artist Salvador Dalí, it became a kind of artistic obsession, recreating the scene many times in the 1930s, and in his book The Tragic Myth of The Angelus of Millet, (1938) argued that the couple had actually been praying over their buried child and that the work contained a message of repressed sexual aggression. Dalí's certainty may have been cemented by the words of the Angelus itself, which essentially condenses the Incarnation of Christ into three short prayers, one for each time of day, followed by the Hail Mary. The prayer for the evening is: 'And the Word was made flesh: and dwelt among us.' In 1963, in response to Dalí's repeated assertions, the Louvre x-rayed the painting revealing an underlying geometric shape similar to that of a coffin in the place where the farmer was now digging potatoes. Regardless of Millet's intention or Dalí's beliefs, there is an awareness of humanity's fall from grace where, having sinned, Adam and Eve were condemned to 'earning one's bread by the sweat of one's brow,' and where redemption existed only in the distant realm of heaven. Compositionally, The Angelus is laid out in Millet's by-now-familiar format: the main subject is located in the foreground of the picture plane, while ancillary features are located in the far background, and little exists in between. As with Millet's other paintings such compositional strategy is reminiscent of works from the Italian Renaissance. Artists such as Giotto, Leonardo Da Vinci, and Raphael utilized this same strategy, along with the use of atmospheric perspective and diminution of figures to indicate deep special recession. But, while Renaissance artists became known for their pyramidal figure arrangement, Millet's are arranged horizontally as if on a stage, a souvenir of 18th century Neoclassical artists like Jacques-Louis David. Artwork description & Analysis: In this unusual nocturne, a flock of sheep mills around the sheepfold, some of them already enclosed in the pen, while the shepherd, holding his staff, urges others through the gate. Behind him, his two dogs wait, ready to assist. The shepherd's hut stands out against the night sky, and a huge, three-quarter moon hangs just above the horizon, lighting up the night allowing him to go about his work, unaided. This depiction of the plains between Barbizon and Chantilly, a landscape Millet knew intimately, is divided between earth and sky. Only the silhouette of the shepherd and the hut connect one realm with the other. In this otherwise realistic depiction of a shepherd's work in a recognizable landscape the scene is suffused with a sense of mystery suggesting associations with the emotional and spiritual realms of Romanticism. Romantic ideas of the shepherd as a Christ figure leading his flock to safety are evoked, and the work barely avoids being allegorical, because it is the moon, rather than a spiritual (and thus, incorporeal) body that illuminates his world. Millet said, "Oh, how I wish I could make those who see my work feel the splendors and terrors of the night! One ought to be able to make people hear the songs, the silences, and murmurings of the air. They should feel the infinite." Interestingly, Millet's tableau scene departs from his customary format by placing the largest figures in the middle and far distance, rather than in the foreground. 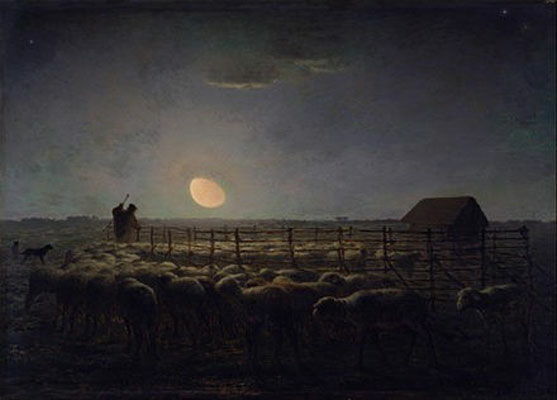 The viewer's gaze is directed more deeply into the composition to the moon, which is the focal point, and the dark, restricted palette allows the bright moon to contrast greatly with the rest of the composition's elements. The dark clouds and the shadowed bodies of the sheep act as brackets couching the scene from above and below, while the figure of the man and the shepherd's hut do the same from the sides, essentially funneling the viewer's gaze to the shepherd, and from him to the moon via his directional gaze. 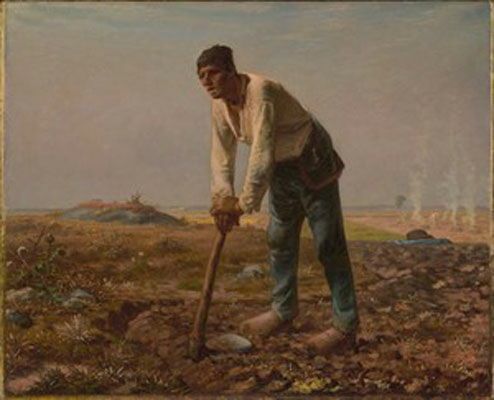 Artwork description & Analysis: Man with a Hoe depicts a fieldworker as he leans over, clearly exhausted from his labors, his hands upon his hoe. His clothes are rough and dirty, his face careworn, as he stares blankly into the distance. The trench he has been turning runs from the front center edge of the rocky foreground, and curves around behind him, leading the viewer's gaze into the middle distance where his jacket and hat are folded on the ground, and further still, where other laborers burn piles of brush in fields already cleared. At the 1862 Salon, both the public and critics reacted adversely to the work seeing the figure as a frightening, brutish giant and the painting itself as a social protest on behalf of peasants. Millet seemed to foresee the response to his work, when he wrote, "The Man with the Hoe will get me into hot water with a number of people who don't like to be asked to contemplate a different world." The contrast of the foreground, rough with rocks and thistles, with the green and productive field in the distance communicates the arduousness of cultivation. The man is exhausted, his feet, wearing rough wooden sabots turn at an angle so the viewer can perceive how he rests his whole weight upon the hoe. His face, staring off into the distance suggests how mind-numbing such work is. The trench he is cutting leads into the distance draws the viewer's eye toward the green field, the eventual reward. Millet wrote, "Is the work these men do the sort of futile labor that some folks would have us believe? To me at any rate it conveys the true dignity, the real poetry of the human race." Millet employs a number of strategies in his painting to convey his sympathetic message of dignity in the labors of man. His man, easily discerned as the focal point of the painting, occupies the greater portion of the foreground and, although his posture bespeaks weariness it creates, with the inclusion of the hoe upon which he leans, a pyramidal arrangement - a compositional element that implies stability, balance, and strength. Millet augments the sense of strength by keeping the horizon line below the center of the canvas. The man thus looms higher in the picture plane, enhancing the viewer's impression of his stature, and as some viewers complained, a sense of intimidation. The figure is surrounded by open space; no other objects compete with his presence so as not to diminish the perception of stature. The result is a sense of heroic strength and nobility in the pursuit of hard work. Such techniques were not new to art and had been used to great effect by painters of the Renaissance including Leonardo, Raphael, Michelangelo, etc., albeit with different intentions. As with many other paintings in his oeuvre his palette consists of simple variations of local color, much of it diluted. Millet's use of atmospheric perspective makes the background colors lighter and more diluted than the foreground. His sky is a hazy blue with lavender overtones, as if from thin cloud cover, and his light source shows from the left, throwing the right side of the figure into shadow. 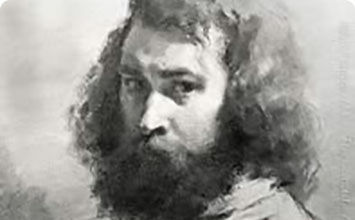 As with Millet's other paintings the facial features are generalized, although the general complaint from viewers was that he appeared brutish and overbearing rather than heroic. Artwork description & Analysis: Depicting the rugged beauty of the Normandy coast, the work shows the view of the ocean from the Gréville cliffs, their greenish brown slopes and the ocean breaking along the rocky shore lit by the sunlight of a hazy golden sky. 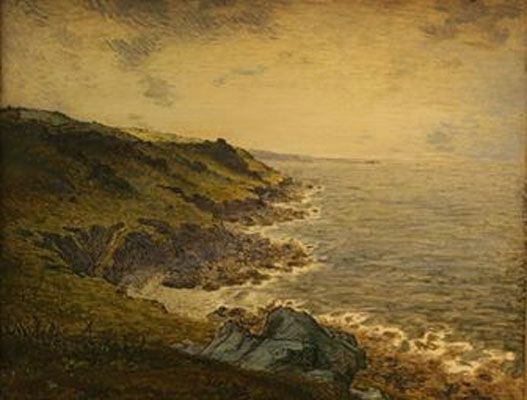 During the Franco-Prussian War in 1870, Millet went home to his family's farm in Cherbourg, on the northern coast of France where he painted this shorescape of the English Channel, a view he painted many times throughout his career. Unlike most of his works that focused on the laborer at work in the fields, this painting features the primal landscape itself. The entire composition conveys a sense of underlying tension. The ceaseless back and forth motion of the waves batters a rocky shoreline that begins in the lower right-hand foreground and undulates throughout much of the central part of the canvas, where it finally meets the far horizon. Yet, for all its sense of movement the asymmetrical segments are so perfectly balanced the composition is saved from devolving into chaos. Millet's painterly style at this point includes loose, gestural brushwork very much in keeping with the Impressionist manner of Monet, and van Gogh's works. The artist used graphite and ink to accentuate certain aspects of his landscape: the rocky shoreline, various planes of shadow on the boulders and the cliff-face, and high up at the horizon. Artwork description & Analysis: Millet's last work, sometimes called Hunting Birds at Night, depicts four people who have gone out to hunt wild pigeons from the flocks that gather in the trees at nightfall. Two figures, one turned toward the viewer and the other facing the trees, use a torch to startle the birds into flight, then run about using cudgels to beat the pigeons out of the air. The one facing the viewer carries a large load of hay upon his back to replenish their torch as it burns. Meanwhile, two additional figures scrabble on the ground, gathering up fistfuls of the fallen birds. 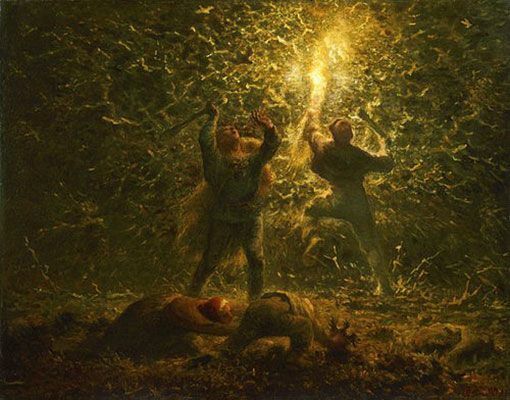 The forest provides a dark green backdrop to the macabre scene of brightly illuminated birds flying frantically in all directions. So different in its frenetic energy from the restraint emphasized in most of his earlier paintings, Millet may have based this work upon early memories of stories of pigeon-hunting. Nearly Impressionist in its brushwork, the effect of light from the burning torch upon the birds imparts a sense of explosive movement. The looser, gestural brushstrokes may also remind the viewer of the works of English naturalist painter John Constable, or even the late works of such great masters as Rembrandt and Titian. But, its overall effect is closer to Abstract Expressionism in its emotional and physical intensity, the visual depiction of a sort of primal frenzy, one that impacted later artists, especially the action painters (called the Tachisme movement in France) of the 1940s and '50s, whose gestural brushstrokes and organic splashes bespeak the movements of the artist himself. First published on 15 Aug 2017. Updated and modified regularly.